Many books have been written on conservative politics. Many more have been written calling Christians to holiness and spiritual revival. Few, however, have managed to combine a clear explanation of the conservative political perspective with its corresponding personal and spiritual virtue. In INDIVISIBLE, James Robison, the founder and president of LIFE Outreach International, partners with Jay Richards, Ph.D., a writer who has appeared in both the New York Times and The Washington Post. Together, they tackle tough, controversial political issues facing conservative Christians today, including abortion, stem cell research, education, economics, health care, the environment, judicial activism, marriage, and others. 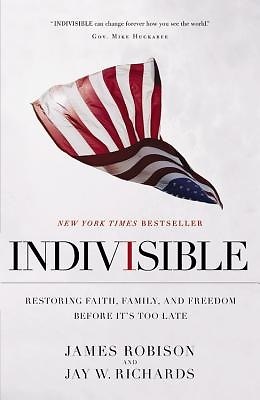 Written to appeal to a broad spectrum of believers, INDIVISIBLE not only argues political questions from a Scriptural standpoint, it also provides simple arguments that Christians can use to support their beliefs in public settings. Most significantly, Robison and Richards recognize that the point of origin for spiritual and moral transformation is the individual. "We are convinced by historical precedent that long term cultural change requires not merely sound thinking and public good works but rather, God's spiritual and moral transformation of us as individuals, which will then transform our churches, our communities, our culture, and ultimately our politics." James Robison is the founder and president of LIFE Outreach International, a worldwide Christian relief organization. He is also the host of "LIFE Today," a daily syndicated television program that reaches 300 million homes in the U.S., Canada, Europe, and Australia. He is the author of many books, including "The Absolutes, True Prosperity, " and "Living in Love, " and has spoken to millions of people through evangelistic crusades since entering public ministry in 1962. Jay W. Richards, Ph.D., is a Senior Fellow at the Discovery Institute and the author of many books, including the award-winning "Money, Greed, and God" and "The Privileged Planet." He is the executive director of the documentaries "The Call of the Entrepreneur" and "The Birth of Freedom." He has been featured in the" New York Times" and the" Washington Post" and has appeared on "Larry King Live." He has also lectured on economic myths to members of the U.S. Congress.